Expectations were high for the Pittsburgh Penguins in the 2013 playoffs, and they didn't include losing that way in the Eastern Conference Finals against Boston. When you have one of the most talented teams in the league, getting swept while scoring 2 goals in the ECF is simply not acceptable. Dan Bylsma won't be the fall guy this offseason, and even more shockingly neither will his assistants. It's almost unfathomable to imagine there won't be any type of shakeup after yet another embarrassing playoff exit, but if there is it'll have to come on the roster. I'll freely admit I think this team needs to go in a different direction at the head coach position. Having said that, if Shero wasn't going to get rid of Bylsma, extending him was the only logical step. With the outcry for Bylsma to be fired and only a year left on his contract, Bylsma's status would constantly be a distraction after every bad loss, and it would only get much worse during losing streaks. That being said, a contract extension for just 2 years is hardly a vote of confidence in this situation. It screams of giving him enough job security to not become a distraction while keeping the term of his contract short so he's not too costly to replace. That being said, if he wants to make it until the end of this extension there are certain things he needs to do differently. It's almost impossible to mention Dan Bylsma as a coach without talking about how large of an impact his belief and faith in his system has on the Penguins. Bylsma places a high level of importance on being able to retrieve the puck and get it back into the other team's defensive zone quickly. He wants a north-south game in transition with his defensemen either making a single D to D pass or, more preferably, connecting on a stretch pass a forward who has gained the red line can tip down into the zone. Once in the zone, maintaining possession is key, and defensemen are encouraged to aggressively pinch along the walls to try to keep the puck in the offensive zone. This style of play has its positives and negatives like any other, but one of the biggest negatives is that the lack of structured neutral zone play makes it easily susceptible to teams that play trap style schemes, like the Bruins did in the ECF, or have great team speed and can close the windows on the stretch passes, like the NYI did in the first round. More concerning is Dan Bylsma's reluctance, bordering on arrogance, to adjust his breakouts by bringing forwards back towards the defensive zone to provide puck support for the defensemen who would otherwise find themselves isolated when the stretch passes aren't there. Most concerning is that this style isn't all that great of a fit for this hockey team as currently run. The talent level is high enough on this Pittsburgh Penguins team that they can win playing any style of hockey, but we've seen in the playoffs against teams with more comparable talent levels that the Penguins are vulnerable playing this system, especially when a similarly talented teams has the time to dedicate to exploiting the system that a best of 7 series provides. This team can score goals with the best of them, and with the offensive talent that plays in Pittsburgh that won't change regardless of the system. However, the defensive ability along the blue line isn't the greatest in their own zone, and when not firing on all cylinders can turn into a liability. Rushing the forwards up the ice to gain the offensive zone as quickly as possible takes away their ability to quickly get back into the play if and when the defensemen run into trouble on the breakout and turn the puck over. Systems need to be adjusted according to the personnel, and Dan Bylsma needs to bring his forwards back towards the defensive zone and actually gamplan play through the neutral zone. This will not only make it easier on defensemen to advance the puck up the ice, but it will also get the forwards back in proper defensive position to help prevent the odd man rushes off turnovers in the transition game. Dan Bylsma, for the most part, seems content to show up and roll lines. It's a fairly well known fact that Dan Bylsma doesn't bother trying to play matchups and feels content to let Sidney Crosby and Evgeni Malkin go out against whoever the opposing team decides to play against them. This is an absolutely maddening strategy, and one where the success of two uber-talented superstars masks the massive flaws in this line of thinking. Crosby and Malkin will find ways to have success against a team's top two lines, but why make it easy for the other team to get the matchup they want? With two players anchoring two separate lines which are that good, the mismatch against a 3rd defensive pairing is absolutely huge, and it's one Dan Bylsma could be fairly successful at getting on a semi-regular basis if he bothered trying. Not only does not playing the matchups prevent Bylsma from getting mismatches anywhere near as much as he should, it also prevents Bylsma from avoiding the mismatches that work against him. We all saw the way Sean Courturier hounded Evgeni Malkin in the playoffs last season. Everyone saw how Patrice Bergeron neutralized Sidney Crosby in the ECF. Bylsma has to actively do something in these situations and try avoiding horrible matchups like those. While it's much harder to do on the road, there is absolutely no excuse for not being able to get it done at home. It's lazy at best and totally dismissive of what a team is able to do to counter his players at the worst. It's also something that needs to change so he can get his best players in the best situations moving forward. Of all the things that Dan Bylsma needs to work on, I find this to be the most alarming by far and the biggest reason why he should not be the coach of this team moving forward. In the salary cap era it becomes increasingly difficult to keep players once they get past RFA status, and this means being able to groom young players to take over once veterans move on is a big factor in being able to maintain success. This is especially true on the blueline in Pittsburgh, as the depth and talent of the prospect pool and advancing age of veteran players makes the successful development of those young defensemen crucial. It's also the one aspect of coaching where Bylsma struggles with the most. Dan Bylsma has an absolutely horrific track record with younger players and has provided little reason to believe he can change this moving forward. Dan Bylsma said at his exit interview press conference that Simon Despres should be playing every night next season and that Beau Bennett would be a top 6 forward, but why weren't they utilized more this season? Beau Bennett showed himself capable of handling playing on Malkin's wing and was also a surprisingly effective energy player on the 3rd line, but he was limited to 26 games in the regular season where he put up a very respectable 14 points, and he only played 6 of 16 in the playoffs. Simon Despres showed flashed of great potential in 33 regular season games yet only played 3 in the playoffs, often finding himself behind a lesser talented player in Deryk Engelland whose main qualification seemed to be a longer tenure in the NHL. Not only do the roster decisions question Dan Bylsma's ability to manage the up and coming talent, but so does how he uses these players in games. Not only are the young players played sparingly, they don't seem to have much of a guarantee of seeing the ice even when they dress. 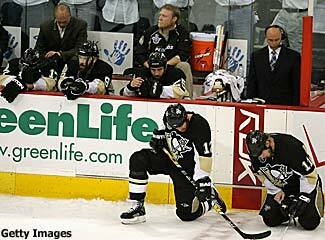 Bylsma would routinely bench a young player for most of the remaining game after making a mistake or two. Former players have addressed this in the media. In fact, nearly every young player to recently leave the organization, from Ben Lovejoy to Brian Strait to Eric Tangradi to Joe Morrow, was either implicitly or explicitly critical of the way the Pittsburgh Penguins handled development. A single player complaining on his way out can be chalked up to sour grapes, but when almost everyone has something to say about how things were handled in Pittsburgh that's a serious problem. Bylsma has little patience for inexperienced players, seemingly regardless of how talented they are, and is a dangerous man to have in charge of playing time considering the team's defense will be in need of several new players in the coming years. Regardless of whether or not he deserved to stay on, Dan Bylsma recently signed a contract extension that runs through the end of the 2015-16 season. Even though he was extended, that should hardly be taken as a ringing endorsement of what he's done. He's going to be on the hot seat, and there needs to be improvement from him in key areas. Ray Shero has said Dan Bylsma has room to improve as a coach, and now he needs to do just that. Hopefully this offseason serves as a wake up call, but given that many of his coaching decision boast an almost arrogant "my way is best" attitude, it's entirely possible we'll wonder why we wasted another year of Crosby and Malkin's primes after our coach watches hopelessly as his brilliant system gets shredded in yet another playoff series. Don't get me wrong, I'm hoping that Dan Bylsma can fix the problems that are currently plaguing this team and brings another Stanley Cup back to Pittsburgh, but I'm not sure Dan Bylsma even realizes a problem exists.